Late winter is the perfect time to prune your apple trees (and all other fruit trees) while they are still dormant. In North Texas and the South, February is the time to do this pruning. Pruning is a skill that I am still developing, but I thought that I would share some of the things that I have learned and read that you may also find useful. For apple trees, there are a couple of different ways to prune your trees. You will need to decide which method works best for you. One method is the central leader method, which essentially shapes the tree into a traditional form with a main trunk. The tree in the photograph above appears to be growing on a central leader. The second method is the open vase or open center method. This format does not have a main trunk but rather has three or four secondary trunks branching from the crotch of the main trunk. For a suburban garden with limited space, my favorite pruning method is the central leader method for a more traditional looking tree with ornamental presence. The photograph below is a tree that has been pruned to have more of an open center. - remove shoots growing straight up - watersprouts. - do not prune more than 1/3 of the tree canopy. 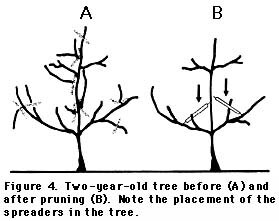 It is very important to focus on pruning for a good shape early in a tree's life, particularly the first three year. When you order a bare-rooted apple tree, you will often receive a whip that is a single, straight trunk without any branches or scaffolding. If you are working with a branchless whip, that first year's pruning will be crucial, because it will establish where the first level of scaffolding or branching starts. 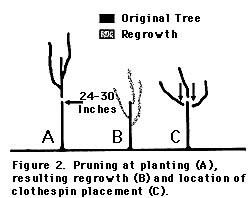 Aggie Horticulture has a nice discussion on pruning - here. The following two diagrams are from the Aggie Horticulture / AgriLife Extension Office's discussion on growing apples in Texas. They provide a good visual for establishing your scaffolding. The following video discusses encouraging a central leader and scaffolding on two year old trees. The next video gives a fairly good overview of pruning a tree using the central leader method. I like this video's treatment of pruning above the bud of a young tree branch to form the tree in a desirable structure. The following video also discusses encouraging a central leader. It also talks about making pruning cuts in order to encourage branching or scaffolds. The following set of videos address pruning a tree into an open center or open vase shape. This method is effective for fruit production because it allows all of the secondary trunks to receive significant sunshine for fruit production. Of course there are other methods of pruning your trees, such as espaliering. Additionally, if you are planting a high density commercial or U-pick orchard, some growers are using high density cordons like the one below. If you are planning to add some plum trees to your landscape, now is the time to order them. Texas A&M recommends that bare-rooted plum trees be planted during the period between January 1st and February 15th and that containerized plants be planted between January 1st and March 31st. In this post, I have listed the varieties that Texas A&M and several other growers recommend as being well suited for growing in North Texas and which have good or acceptable taste. I have also listed several additional varieties that have been highly ranked for exceptional taste but that have not necessarily been tested or approved for our climate. Richard Ashton, who owns Oak Creek Orchard, recommends Methley as probably the best plum for growing in North Texas. He also comments that there are several of the Auburn University plums that have fairly good taste and will grow in North Texas. Mr. Ashton does not care for Bruce's taste qualities, even though it is recommended by many extension agents and other growers. Bob Wells of Bob Wells Nursery has three favorite plum varieties. He likes the Methley which he describes as dark purple and "the sweetest plum grown." He also likes Morris which he describes as an extra large freestone plum with purple color. Finally, he suggests Bruce which is an early ripening, large red plum. Dale and Judy Ham operate Ham Orchard in Terrell, Texas. The Hams' favorite plum varieties for North and East Texas are Methley,Morris, Santa Rosa and Ozark Premier. Glynn and Sandra Russell operate Newburn Farms in Center, Texas. They prefer Ozark Premier with its large, golden meat and very sweet taste. They are also in the process of adding Santa Rosa plums to their orchard. Texas A&M has published several articles that recommend different varieties for Texas. In Recommended Fruit, Nut and Berry Cultivars for North Central Texas, they recommend: Morris, Methley, Ozark Premier, and Bruce. In a separate publication, Texas A&M also recommends: Gulfruby, Gulfgold, and Allred. Methley: A purple-red skinned, medium sized plum with red flesh. It ripens early. It has juicy and sweet flesh, but the skin is astringent. It is self-fertile and can be used as a pollinator. It is a medium sized tree with only 150 chilling hours required to set fruit. It can sometimes have problems with black knot in the north. Morris: A reddish-black skinned, medium-large sized plum with red flesh. It ripens early, and its flesh is firm, somewhat dry, and crisp with good flavor. It is a large tree that requires 800 chilling hours and a pollinator. Ozark Premier: A red skinned, very large sized plum with yellow flesh. It ripens mid-season, and its flesh is firm, juicy, and tart with good flavor. The skin can be tough. It is a cross of Methley and Burbank. This is a medium sized tree. Santa Rosa: Reddish purple skinned, very large plum with reddish/pink flesh. It ripens mid-season, and its flesh is fine-textured and aromatic and has a very good flavor. It is partly self-fertile and only requires about 300 chilling hours. It is a large tree that was introduced by Luther Burbank. Bruce: A red skinned, large sized plum with yellow flesh. It ripens very early, and has good taste. A medium sized tree that requires a pollinator. Introduced in Texas, and it is believed to be a cross between Abundance and Excelsior. Allred: A red skinned, small plum with red flesh. It ripens early, and its flesh is sweet-tart that is better for processing. Its leaves are red making it an unusual and nice ornamental selection. A medium sized tree that was introduced by Wolf Nursery in Stephenville, Texas. Gulfruby: A reddish purple skinned, medium-large plum with yellow flesh. It ripens early, and its flesh is sweet with a bitter skin surrounding it. This medium sized tree has a low chill requirement. Gulfgold: Yellow skinned with a red blush, this medium sized plum has yellow flesh. It ripens mid-season, and it is the sweetest of the Gulf series which makes it well suited for dried fruit. This small tree is susceptible to plum leaf scald. If you are interested in growing plums, Texan Richard Ashton has authored a great resource that provides an extensive list of plum varietals and their characteristics entitled Plums of North America. What I do not know is how well suited these varieties will be for the hot, humid climate of Texas and the South. The P. domestica varieties may have difficulty in our climate. The japanese types, P. Salicina, typically perform better in the South. Cambridge Gage: A green skinned, medium sized plum with greenish yellow flesh. It ripens in late mid-season with dense, firm flesh and that rich gage flavor. It is a medium/compact sized tree and partly self-fertile. Campagne (P. salicina): A deep red skinned, large sized plum with yellow flesh. It ripens early, and its fruit are juicy and aromatic with a good texture. A medium sized tree with good resistance to disease. Kahinta (P. salicina x P. americana): A blue skinned, medium-large sized plum with yellow flesh. It ripens early with a very good to excellent taste. Its intense flesh has a spicy flavor which is more spicy than sweet. It needs a pollinator, and is a small to medium sized tree. It can be susceptible to brown rot, and its wood splits easily. Morganhill: Reddish purple skin with brown dots, this plum's flesh is greenish-yellow. It has small sized fruit. It ripens late with a sweet aromatic taste, and some say it has one of the best tastes. It was introduced by Luther Burbank and is a medium sized tree. Pearl: A golden-yellow, medium large plum with deep yellow flesh. It ripens mid-season on a medium sized tree. Its flavor is very good to the best, with rich, sweet, luscious flavor and melting flesh. Developed by Luther Burbank, it is believed to be a seedling of a Reine Claude plum. Red Beaut (P. salicina): Red over yellow skinned, this large fruited plum has yellow flesh. It ripens very early with crisp flavor that is melting sub-acid and delicate. It is a medium sized tree. Reine Claude (Green Gage): A green to golden yellow skinned medium-large plum with greenish-yellow flesh. It ripens mid-season with a richness of texture and flavor and an abundance of juice and aroma. Considered unsurpassed. A small to medium sized tree that can be delicate and vulnerable to sunscald. Reine Red: Similar to Reine Claude but with red skin. Ruby Queen (P. salicina): A reddish black skinned, medium sized plum with dark red flesh. It ripens mid-season with excellent sweet, balanced taste and a firm texture. This medium sized tree requires a pollinator. Superior (P. salicina): A dark red skinned, medium sized plum with yellow flesh. It ripens mid-season with very juicy, sweet, and firm flesh. It is a large tree that may sometimes have problems with brown rot and split fruit. Supreme (P. nigra hybrid): A red over yellow skinned, large plum with yellow flesh. It ripens mid-season with an excellent quality taste. It is a medium sized tree. Voyageur: A dark reddish-purple skinned, medium-large plum with yellow flesh. It ripens mid to late season and has juicy, firm, excellent taste with high sugar content. A medium-large tree than can serve as a good pollinator forP.domestica. Au Rosa: A red skinned, large plum with yellow flesh. It ripens mid-season, and its flesh is firm and of good quality. A medium sized tree with a winter chilling requirement of 750 hours. It needs a pollinator and is generally well suited for the South. Purple Heart: Dark reddish-purple skinned, medium sized plum with dark red flesh. It ripens mid-season with firm, juicy, sweet and crisp flesh. It is a small tree that is hardy and popular. Shiro: Bright yellow skinned, medium sized plum with light yellow flesh. It ripens very early and has a pleasant taste. Juicy, somewhat melting, sweet and mild flesh. Medium to large sized tree that can be susceptible to brown rot. Pollinate with a japanese type plum. Developed by Luther Burbank. Toka: Blue-black skinned, large sized plum with amber flesh. It ripens late with a mild and medium sweet flavor. It is a medium to large sized tree that is slightly susceptible to brown rot. Waneta: Yellow with red blush skinned, medium to large sized plum with orange flesh. It ripens mid-season with juicy and sweet flesh. The skin is astringent. This small sized tree requires a pollinator. Acme; Amador; Amazon; AU Amber; AU Homeside; AU Producer; Autumn Queen;. Bavay; Black Jewel; Black Kelsey; Black Noble; Blue Bell. Early Transparent Gage; Eldorado; Elephant Heart; Emerald Beaut; Ersinger; Explorer. Geewhiz; Geneva Mirabelle; Golden Nectar; Golden Transparent Gage; Grandoro; Green Sweet; Guthrie. Mammoth Cardinal; Mason Early Italian; McLaughlin; Meredith; Middleburg; Miller Superb; Mohawk; Monroe. Pembina; Perfection; Peters; Ptitsin 5; Purple Gage; Purple Heart. Redheart; Reine Claude Conducta; Richards Early Italian; Rivers Delight; Royal Tours; Roysum. Santa Rosa; Sergeant; Spaulding; Stanton; Stark MacVerna Delicious; Sugar. Valor; Vanier; Victor Large; Vision. When selecting your trees, it is very important to look closely at the rootstock upon which the trees are grafted. The rootstock will dictate how large the tree will get. You do not want to plant a tree that will get too big for the space in which you are placing it. You will be very disappointed and, along with the additional work entailed, the additional pruning to keep its size in check may adversely impact fruit production. While a few varieties are self-fertile, you are typically going to want to plant at least two varieties of plums trees to ensure proper cross-pollination and fruit set. This is not intended to be a guide for planting a plum tree. If you are looking for that kind of guidance, I recommend that you visit this link for a pretty thorough "how-to" primer. Nevertheless, when you plant your trees, I encourage you to add compost and Mycorrhizal fungi to the backfill when you are planting. Finally, in caring for your plum trees, I have found that the occasional spraying of Garrett Juice or compost tea seems to ward off problems for me. If you have planted plum trees in Texas that are bearing fruit, please post a comment and share your experiences along with your favorite varieties for Texas. There seems to be a fair amount of agreement on the varieties of pear trees that you should be growing in North Texas. Most resources recommend fireblight resistant, Oriental hybrid varieties that can be just as good as the European pears. Everyone seems to agree that the European pears such as Bartlett, Doyenne, Bosc, Comice, and D'Anjou do not do well in Texas because of fireblight. This is a real shame because these varieties are excellent varieties for fresh eating with their fine, sweet, melting flesh. Warren. Excellent dessert quality in both the flesh and peel with a smooth, buttery texture and small- to medium size, red-blushed fruit. Ripens in August. Highly resistant to fire blight. A seedling tree discovered in Hattisburg, Mississippi by T. O. Warren. Ayres. Excellent dessert quality, although not as good as Warren. Medium-size fruit with a brown russet and red blush. Ripens in August. Highly resistant to fire blight. Magness. Excellent dessert quality with medium size fruit similar to Warren. Ripens in August. Highly resistant to fire blight. Bob Wells of Bob Wells Nursery, an East Texas nursery specializing in fruit trees and bushes, also recommends Ayers which he says is a "very sweet summer pear." Mr. Wells also favors Orient which he says is a "large bell-shaped pear" that "ripens late summer" and is "very sweet." He also likes LeConte which he describes as a "crisp, sweet summer pear" with "great color." Maxine. Very good dessert quality with medium to large attractive fruit. Good to fair fire blight resistance. Ripens in August-early September. Reported to be the same pear as Starking Delicious. Moonglow. Good dessert quality with medium to large fruit that ripens in August-early September. Good fire blight resistance. Garber. Good dessert quality with medium to large, crisp-textured, attractive fruit of a shape similar to Delicious apples. Ripens in August. Good to fair fire blight resistance. Often called apple-pear or pear-apple. LeConte. Good dessert quality, medium-size, attractive fruit that ripens in August-early September. Fair fire blight resistance. Fan-Still, a variety propagated and sold in the San Antonio area, appears to be a LeConte seedling with similar quality and reported better fire blight resistance. Monterrey. Good dessert quality with large fruit that ripens in August-early September. Good fire blight resistance. Propagated and sold chiefly in the San Antonio area. Orient. Fair dessert quality, coarse textured, russetted, medium to large fruit. A consistent, heavy bearer that ripens late August-September. Highly resistant to fire blight. Used primarily for canning/baking. Kieffer. Old standard, coarse-textured fruit that are poor to fair for dessert use but good for canning and baking. A consistent, heavy bearer that ripens late September-October, highly resistant to fire blight. You will note that AgriLife's opinion differs from Mr. Wells on LeConte and Orient, but that just goes to show that the issue of taste can often be very subjective to the individual with different people preferring different taste characteristics. Seckel. Described as a small to medium yellow russetted pear with extraordinary flavor. The fruit is extremely sweet and very juicy with a distinctive, spicy, rich, aromatic flavor. It is also known as the "sugar" pear which is all I needed to hear! It is self-fertile, fireblight resistant, and requires 500 chill hours. Pineapple. Crisp flesh which is said to have a pineapple flavor. It is yellow in color blushed with red. It is also self-fruitful and fireblight resistant. It requires approximately 150 chill hours. Interesting, all of these suggestions seem to overlap more or less with an article in Mother Earth News which rated some of the top flavored pears as: Magness, Kieffer, Pineapple, Seckel, Warren, Maxine and Honeysweet. Not previously mentioned, several other sources claim that the Potomac is also an excellent, fire-blight resistant variety introduced by the USDA in 1993 with rich buttery taste. It's parents are D'Angou and Moonglow. I myself have planted the following varieties in my garden: Orient, Moonglow, Monterrey, Warren, Magness, Kieffer, Pineapple, and Seckle. While several varieties listed here are self-fertile, you are going to want to plant at least two varieties of pear trees to ensure proper cross-pollination and fruit set. Some varieties require a cross-pollinator. Even the self-fertile varieties will set more fruit with another pollinator. To ensure good cross-pollination, make sure that you have two varieties that will bloom around approximately the same period of time. I have not found a thorough list of bloom times for all of these Oriental hybrid varieties, yet. However, note that Moonglow, Seckel and Honeysweet should be good pollinators for the vast majority of these varieties, with the exception of Magness. Magness will not be a good pollinator, because it is sterile. Many varieties of pears, even the more resistant varieties, can be impacted by fire blight. The best way to avoid fire blight is to not use fertilizer with a high nitrogen content. Excessive amounts of nitrogen encourages fire blight. If fire blight does show up, cut the infected branch off as soon as you can and destroy it. In caring for your pear trees, I have found that the occasional spraying of Garrett Juice or compost tea seems to ward off problems for me. Additionally, the makers of Actinovate claim that the use of their product as a foliar spray can help prevent fireblight. If you have planted pear trees in Texas that are bearing fruit, please post a comment and share your experiences along with your favorite varieties for Texas. If you are planning to add some peach trees to your landscape, now is the time to order them. Texas A&M recommends that peach trees be planted before March 1st. In this post, I have listed the varieties that Texas A&M and several other growers recommend as being well suited for growing in North Texas and which have good or acceptable taste. Depending upon the variety, peaches can ripen anytime from April until August. Consequently, it is a good idea to plant a mixture of cultivars that will provide you with fruit over an extended period. Jim Kamas was kind enough to offer his opinions on some of the best and most flavorful peach varieties to grow in Texas. He is an Assistant Professor & Extension Horticulturist for Fruits at Texas A&M's Department of Horticultural Sciences. He is also the author of the Texas Peach Handbook. The first peach variety that Jim suggests is Harvester. He describes Harvester as a semi-freestone peach with outstanding flavor and good, but not excessive firmness that colors well. It has an "[e]xcellent sugar/acid balance and when fully ripe, the flesh pulls away from the pit quite easily." The fruit of this variety are of a good size, and it is a consistent producer that ripens in mid-June in North Texas. Jim also recommends Loring, especially for home owners. Loring ripens about the fourth of July and can produce exceptionally large peaches, often reaching three and a half inches in diameter. According to Jim, this variety is "highly prized for its outstanding flavor and some commercial growers get premium prices because of consumer demand." It can be "a little finicky in setting a large crop, but for homeowners it is an excellent choice of a mid-season freestone variety." For mid-July, Jim Kamas' favorite peach cultivar is Redskin. Redskin is a consistent producer of good sized, deeply colored fruit with the occasional bit of red color in the flesh. "Fully freestone, Redskin is among the most flavorful peaches grown in our area and has been a reliable standard variety for homeowners and commercial growers alike." It is also commonly the variety of choice for canning or freezing. Bob Wells of Bob Wells Nursery independently agrees with Mr. Kamas. Bob's three favorite peach varieties are also Redskin,Loring, and Harvester. Dale and Judy Ham, who operate Ham Orchard in Terrell, Texas, offer a few additional, recommended choices for planting in your orchard. In addition to Loring, the Hams prefer Red Globe, Bounty, and Dixiland for North and East Texas. All are freestone peaches that ripen the first of Juy to July 23rd or 24th. Red Globe is a freestone variety producing a large, round, dark red skinned peach with yellow flesh. This variety is eye appealling, and some sources state that it requires approximately 850 chilling hours. It ripens in the first half of July. Bounty is described as a very good, large, smooth skinned peach. It is a high quality late bloomer. It is an attractive, freestone fruit with a cherry-red blush and yellow flesh. Some sources state that it requires approximately 800 chilling hours. It ripens in the first half of July. Dixiland is described as a popular freestone peach with good color. According to some sources, it requires approximately 750 chilling hours. It ripens in the second half of July. Glynn and Sandra Russell operate Newburn Farms in Center, Texas and their favorite selections are Red Globe and Harvester. As to these two varieties, they think the "best East Texas peach is the Red Globe. It matures around the first of July and has a sweet and mild taste with melting flesh." Harvester is hardy and the first freestone to ripen. The Russells describe Harvester as having excellent taste with a stronger flavor of peach than Red Globe. Of additional interest, in an article in Mother Earth News, the author polled several growers who rated the top flavored peaches to be: Reliance, Saturn, Redhaven, Tropic Snow and May Pride. Reliance: Reliance produces a medium sized fruit that is dark red splashed over a yellow background. This freestone peach is sweet, flavorful, and good for canning, freezing and fresh use. The tree is vigorous, fast growing, and has showy, bright pink blossoms. It is a late blooming variety. It is cold hardy and some sources state that it requires approximately 1,000 chilling hours. Fruits ripen in June. Saturn: Also known as the Peento peach, the fruit of this variety are shaped like a doughnut, without the hole. They have large, showy double pink self-fertile flowers. The very sweet and tangy, large yellow fruit has melting white flesh. Some sources state that it requires approximately 400 chilling hours. The tree is vigorous, spreading, and resistant to bacterial leaf spot. Ripens in early July with Redhaven. Redhaven: This is a widely planted freestone peach. Its fruit are medium to large sized and have firm yellow flesh. High quality yellow freestone. Some sources state that it requires approximately 950 chilling hours. It ripens in early July. Tropic Snow: Tropic Snow has creamy white, delicious flesh and is a freestone type peach. Balanced acid and sugar, with superb flavor. It ripens in May, and some sources state that it requires approximately 200 chilling hours. It is from Florida, and was introduced in 1988. May Pride: This variety produces a very early-ripening peach for warm winter climates. Ripening in May, it has delicious, sweet and tangy fruit. Very large for such an early peach. It requires approximately 175-200 hours. It is a patented variety from Zaiger. To date, I myself have planted Springold, Sentinel, Ranger, Red Haven, Jefferson, Saturn, and Reliance. This is not intended to be a guide for planting an peach tree. If you are looking for that kind of guidance, I recommend that you visit this link for a pretty thorough "how-to" primer. When you plant your trees, I encourage you to add compost and Mycorrhizal fungi to the backfill when you are planting. Finally, in caring for your peach trees, I have found that the occasional spraying of Garrett Juice or compost tea seems to ward off problems for me. If you have planted peach trees in Texas that are bearing fruit, please post a comment and share your experiences along with your favorite varieties for Texas. This is a re-post from last year that has been updated with additional information. However, it has been suggested that these rootstocks will grow smaller trees in hotter climates like Texas. Consequently, an MM-111 that typically will grow to 12 to 15 feet, may only grow to 8 to 12 feet. See this posting for further discussion - rootstock. Remember that the Triploid varieties are not effective pollinators. * The Apple Grower, Michael Phillips, Chelsea Green Publishing Company (2005). Believe it or not it is time for you to think about ordering your strawberry plants for fall planting. You need to do it soon before the suppliers sell out for the year. If you get them planted early enough this fall, you have a shot of getting some production out of their first year this coming March and April. If you are interested in an edible landscape in your yard, I personally think that strawberries are your first go-to option. They take up limited space. They are relatively easy to take care of. And they produce fairly quickly compared to other fruits. Without question, strawberries are the best fruit for beginners. When I first started growing strawberries, I focused on Everbearing varieties because I naively thought that it would be great to be able to harvest strawberries throughout the year. Little did I know then that Everbearing varieties will only produce in the Spring in Texas -- similar to June bearers -- because our summers are so darn brutal! I have come around full circle now, and I intend to plant more June bearers this fall. Typically, June bearers are known to have better taste and bigger berries than Everbearers, but some of the Everbearers are pretty darn good, too. June bearers fruit just once a year for a period of approximately two to four weeks. (If you plant early, mid-season, and late varieties, your harvest can extend to eight weeks.) In Texas, instead of calling them Junebearers, they should call them March bearers or April bearers because that is when our berries ripen given the earlier last freeze in Texas. We just barely survived the worst drought and the hottest summer of recorded Texas history. Many of my strawberry plants that were in full sun took it on the chin and perished --- or at least they look like they perished (there is a chance that some of them may come back as temperatures cool down). I am going to use this small scale devastation as an opportunity to revive my strawberry beds. This time around, I am going to do things a little bit differently. One thing that will not change, however, is that I am going to continue to plant more Seascape everbearers. Even though I do intend to primarily plant June bearers this Fall, I absolutely love Seascape for Dallas and will stick with them. The Seascape berries are enormous and have great taste. Also, the plants have been the hardiest of all of the strawberry varieties that we have planted. (We have planted the following varieties over the last few years: Seascape, Ozark Beauty, Quinault, Tristar, Ogallala, Lateglow, Jewel, Allstar, and Earliglow. As to the June bearers, a trip to the grocery store this summer has affected my decision on what to plant this Fall. Earlier in the summer, we picked up some in-season California strawberries from the grocery store and came across some of the most enormous strawberries that I had ever seen. I am not exagerating when I tell you that some of these strawberries were 3 inches big. Huge! They also had very good taste. I really want to find and grow that variety of strawberry. But, I haven't done enough sleuthing yet to determine what variety they were. Nevertheless, I suspect that they might have been Benicia, which is restricted to California growers for the next two year. Instead, I went looking for other varieties with really big berries and good taste and for varieties that are very heat tolerant with great taste. A few other varieties also piqued my interest, but I could not source them or the sellers were sold out for the year: Selva (large strawberry); Sonata (heat tolerant); Evie 2 (heat tolerant); and Chandler (great taste and good for California and the South). I appreciate that Cabot is a northern variety, but I am willing to risk planting a northern variety because of its large berries. I am going to plant the Cabots where they get afternoon shade, so I am hoping they will acclimate just fine. Speaking of afternoon shade . . . almost everyone who writes about strawberries recommends that you plant them in full sun. I am here to tell you that I don't think this advice works well for Texas given our hot, brutal summers. In fact, my strawberry beds that get afternoon shade do the best for me. In contrast, the beds in full sun tend to burn out. Another change that I will make when I plant these new strawberry plants is that I will avoid closely planting them together. In the past, I have had unbroken masses of plants. I think that planting in this fashion may have been a mistake. By massing the plants, I made it easier for slugs and pill bugs to hide out and ravage the strawberries. It also made it more difficult for me to find all of the berries and harvest them. Consequently, with this planting, I am going to separate out each plant from the others by planting them at 2 foot intervals. I am hoping that this will make it easier to keep the beds tidier, free of insects, and easily harvested. So, get out there and order your plants and get them in the ground. And when you order them, I recommend that you plant at least 25 plants to ensure a good harvest. Typically, bunches of 25 crowns can be purchased for a very reasonable amount of money -- any where from $8.00 to $15.00. While the crowns don't look like much when they arrive, they typically do very well once planted in the ground and given some moisture. Nothing tops a flowering perennial plant in a Texas garden. Forget annuals. Go with perennials. They come back year after year and can be very drought tolerant depending upon the variety and once established. They also are nature magnets, create great color, and can be very fragrant. You can also get some great cut flowers for a bouquet from some of these plants. I have been growing flowering perennials for many years now in North Texas, and I have developed several personal favorites. A plant earns my attentions if it has a long flowering season and is hardy and drought tolerant. I am also always looking for perennials that are fragrant and will attract butterflies and bees. Some landscapers determine perennials based upon color scheme and complimentary colors. Personally, I like to combine a lot of different colors. However, I do have a tendency to gravitate toward blues, pinks, lavenders, and white. Below are a couple of photographs of two perennial beds that I installed in the front of my house last year. This bed has been in place for one year and still has yet to mature. Within one or more years, it should be a single, non-stop bed of flowers with no mulch showing. These photos were taken after several weeks of 100 degree heat with little rain. The plants are suffering a little, but they are still holding up fairly well. In the first beds you can see the low growing Homestead Purple Verbena (front), Magnus Purple Coneflower, Walker's Low Catmint (right side of photo), Sunny Border Blue Speedwell (between the verbena and coneflowers), Autumn Joy Sedum (not blooming, small plant behind the verbena), Purple Liatris (barely seen behind the confeflowers), and Becky Shasta Daisies (barely visible behind the liatris). 1. Walker's Low Catmint: I love this plant. It is a mounding, mid-sized plant that I like to put at the front of a border. I particularly love this plant because it blooms non-stop from March until November. It has blue flowers that grow at the ends of arching panicles or racemes, and the flowers attract bees and butterflies. The leaves are fragrant to the touch. This plant is very hardy. It will typically grow one to two feet high, and is spreading to two to two and a half feet wide. It can be kept tidy and in check through mid-season shearings. I think this plant looks best in a mass planting along a row. 2. Magnus Purple Coneflower. Another beautiful, hardy plant for Texas. This plant will bloom through much of the season, from late April until early November. You will need to cut off the spent blooms to encourage re-blooming. It's blooms are pink and shown in the photograph below. The flowers are fragrant if held to one's nose and attract butterflies. These plants re-seed and spread very well. The flower stalks will often reach two to two and a half feet tall. 3. Sunny Border Blue Speedwell. This is another perennial with a really long blooming season. They bloom from April through October for me. The beautiful blue flowers grow in spikes that bloom from the bottom up. Over the season, the flower stalks keep growing and growing up. Once they start to get rangy, I will often cut them back somewhat, and they start growing right back. You can see what the flowers look like in the photograph above. These plants start fairly compact and rarely get taller than two feet for me. Hence, I like to use it as a second level plant in between the short front row and taller plants in back. Bees and butterflies also like this plant. 4. Becky Shasta Daisy. This is a very vigorous and hardy form of white daisy. It grows to one and a half to two feet tall and is spreading. It has a shorter bloom time than the previously mentioned plants, but it is still one of my favorites. It usually will flush with beautiful white flowers from June through July, and then with dead-heading, it will continue to flower less heavily through the summer. Bees and butterflies also like to rest and dine on the large flower heads of this plant. 5. Homestead Purple Verbena. This is a low growing, spreading plant. It will not grow taller than one foot, so it is perfect for the front of the bed. It has pretty purple flowers as its name suggests. It is one of the first perennials to flower in the spring blooming heavily for a month or more. It blooms intermittently in the summer, and then it blooms heavily again in the fall as temperatures lower. This is a hardy verbena that is well suited for our zone 8 winters. Many verbenas that you find in nurseries will not make it through our winters. 6. Nanho Purple Butterfly Bush. This plant is more of a bush than a perennial; however, it does not have much structure, so I treat it more as a perennial to go in my flowering perennial beds. There are dwarf varieties of this plant, but those do not flower quite as much. The regular varieties can grow to four feet tall in my experience, so you have to give them room. I like to plant Walker's Low Catmint or Homestead Purple Verbena around their base. This is an interesting plant with many attributes. I think it is one of the most fragrant perennials for Texas gardens. When in bloom, you can smell its blooms from ten feet away. The blooms have a wonderful vanilla scent. The large blooms are also magnets for some of the larger butterflies such as swallowtails and monarchs. It also attracts hummingbirds in the spring and fall. This plant will have a huge flush of blooms in late Spring (late April or May), and then bloom sporadically throughout the summer and into the fall. It has a tendency to bloom for a couple of weeks, sit with spent flower heads for a couple of weeks, then bloom for a couple of weeks, then sit again, etc. You can speed up the reblooming process by cleaning the spent racemes off the branches, but that is a lot of work. Thus, I usually let the flowers regenerate on their own. 7. Firewitch Dianthis. This is not a very ornamental plant in that it is very low growing to only six inches and has a mounding habit. I think it is best grown in multiple groups of six or more plants, in the front of the bed. This plant is fairly heat and drought tolerant. It is at its best in early spring and fall when it they are filled with a profusion of dainty pink flowers. The real magic of this plant is the heavenly scent of its flowers. You will walk through your garden in the morning and in the early evening and smell its intense, richly sweet smell, and you will wonder from where that smell is coming. You can smell these plants from twenty to thirty feet away when in full bloom. They really are amazing in this regard and a necessity in any fragrant garden. 8. Blue Fortune Hyssop / Agastache. This is a great plant that flowers from April through November with a profusion of light blue spikes of flowers that are bee magnets. This plant looks great planted next to Magnus purple coneflowers. The leaves have a light, minty smell that can be used in teas. It needs its space and can grow from three to four and a half feet tall by the end of the year. This plant is shown in the photograph below. In truth, I love all agastaches. They are almost all very drought tolerant. Many agastaches have wispy flowers growing to three to five feet tall. Because they are a wispy plant, I like to grow them mixed in with other plants like liatris. High Country Gardens Nursery sells a lot of different agastaches by mail order. 9. May Night Salvia Nemerosa. I love salvias. I find many perennial salvias, like autumn sage salvia greggii, can get rangy and require frequent pruning. However, salvia nemerosa is a low growing salvia that is good for the front of a border. Its flowers grow in long blue racemes. It is heat and drought tolerant. I typically find that this plant will flower heavily in the spring and fall, but only sporadically in the summer. 10. Purple Liatris. This plant does not have a long bloom time in my experience, but it is still worthy to be in your perennial bed mixed in with your other tall perennials. It grows to three or four feet with beautiful purple spikes of flowers that bloom from the top down. Butterflies and hummingbirds like this plant. It typically blooms in May and June in North Texas. A photograph of this plant is shown below. 11. Goldsturm Black Eyed Susan. This is a tough plant that has pretty yellowish-orange blooms that look similar to daisies in shape. It grows to approximately two and a half to three feet tall. In my experience, it typically blooms from June to July. 12. Autumn Joy Sedum. This is a good plant for additional, subtle late fall color. It is very pedestrian throughout the year until October. In the fall, it develops large flat-headed bracts of flowers which bloom once the temperatures drop. It has soft pink flower heads that grow to approximately one and a half to two feet tall. 13. White Flowering Tobacco / Nicotiana. I really love this plant because of its intense evening fragrance. It is not a very shapely plant. It grows in a mounding fashion to about one and a half feet tall, but it then releases tall protrusions of white flowers that can reach three feet tall. I think it is best suited in the second row of a perennial bed. Planted in groups of three or more plants, these plants come to life at dusk. They emit a rich vanilla smell that can be sensed from across the garden up to twenty or more feet away. Although these plants are not considered to be cold hardy, I have had very good luck with them returning every year for me, and they will also re-seed. Below are few photographs of two new perennial beds that I planted this spring around the perimeter of vegetable garden. These plants are interplanted among kiwi, cherry trees, and peach trees. As you can see, these perennial plants are still very immature and have not filled in. They have a long way to go. Some of the plants have had a difficult time getting established this summer with the drought, but the majority of them have done well. I am confident that these will fill-in next year to become a colorful and fragrant safe harbor for all of our beneficial insects. Here are a few more perennials that also have found their way into my perennial beds. Autumn Sage. This is a fine plant that blooms most vigorously in spring and fall. It needs a lot of room, and it requires frequent prunings to stay tidy. It comes in red, pink and white. Sculleteria. It is a good front of the border plant in that it rarely grows taller than one foot. It blooms throughout the summer, but the blooms are very small and subtle. It can be a good change of pace for the front of the border. Mexican petunia. This is another low grower that comes in white, pink, and purple. It can be a vigorous spreader. The plant looks somewhat like low growing monkey grass, with pretty, bell-shaped flowers. Mexican bush sage. This is a fall blooming perennial that can grow from three to five feet tall. It is for the back of a perennial bed.